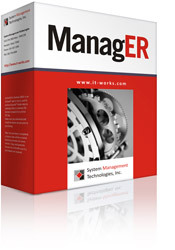 IT Works ManagER is a multifunction application designed as a complete management tool for Microsoft® Windows® family of operating systems. ManagER includes functionality for System Management, User Management, Network Management and HelpDesk Management, all integrated into one user interface (UI). ManagER is a flexible, customizable and extensible tool and provides the administrators with the ability to customize ManagER’s "system" menus to individual preferences and the ability to disable certain menu options to individual preferences. ManagER integrates with Microsoft® Outlook 2003/2007 for HelpDesk user communications, including service request status and the ability to use Outlook Forms in the collection of User information which can be imported into ManagER’s database. The complete ManagER system consists of a SQL Database, a Full Featured Client Application and an Optional Web based system. Click here for a technical presentation of IT Works ManagER. 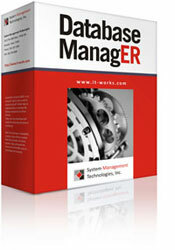 Click here for Database ManagER's technical presentation. Domain Run is a NT Command line utility that has 2 main uses. The first is to run a generic command line statement for selected or all computers in a domain. The second is to run a process/program, remotely, on each computer in a domain. Click here for DomRun's technical presentation. The nodes in the Domain Access Object may contain sub-nodes (containers) where appropriate to further segregate domain elements. For example, the computer node contains many sub-nodes such as Resources (disks, printers, and shares), the Registry, the Environment, Tasks, Services, Devices and Processes specific to the selected computer node. The computer node also contains the attributes of the selected computer such as the OS and version, the remote time, interactive user plus many additional attributes and elements. 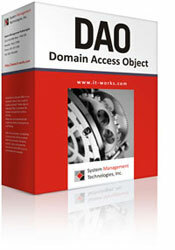 Another feature of Domain Access Object are the methods to initiate actions to be taken upon elements of the domain. For example, the computer object has methods to send a message to the computer, logoff the interactive user, reboot the computer, start/stop processes, services, devices plus many more. ArchivER for Outlook 2010/2013/2016/o365 is an Outlook® 32/64 BIT ADD-IN that is used for archiving email folder data to individual files in common file formats instead of an archive PST file. Why do this? How long will Microsoft support the PST format? Will it be years? Who knows? This utility will extract the items from your Outlook folders and store them in the common formats (Rich Text, Text, etc,) in the same hierarchy/Folder structure and with the date/time the item was received or created. This conversion makes your historical email data much more accessible for email discovery or searches. Click here for ArchivER 4.x's technical presentation. ArchivER for Outlook 2003/2007 is an Outlook® ADD-IN that is used for archiving email folder data to individual files in common file formats instead of an archive PST file. Why do this? How long will Microsoft support the PST format? Will it be years? Who knows? This utility will extract the items from your Outlook folders and store them in the common formats (Rich Text, Text, etc,) in the same hierarchy/Folder structure and with the date/time the item was received or created. This conversion makes your historical email data much more accessible for email discovery or searches. Read the ReadMe.txt for installing with Outlook 2010. Click here for ArchivER 3.x's technical presentation. ArchivER is a Stand-Alone Outlook® utility that is used for archiving email folder data to individual files in common file formats instead of an archive PST file. Why do this? How long will Microsoft support the PST format? Will it be years? Who knows? This utility will extract the items from your Outlook folders and store them in the common formats (Rich Text, Text, etc,) in the same hierarchy/Folder structure and with the date/time the item was received or created. This conversion makes your historical email data much more accessible for email discovery or searches. Click here for ArchivER's technical presentation. 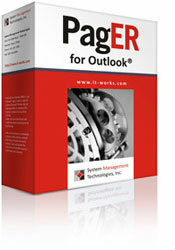 PagER is a Stand-Alone Outlook® utility that is used to send Calendar reminders to your pager. Just like you receive a reminder for a meeting from Outlook when you are working at your computer, Pager will send you the same notification to your pager. This utility requires Exchange Server and a pager with an e-mail address. ProfilER is an automated MS Exchange/Outlook® profile generator. This utility can be run as a GUI or in a command line mode (batch scripting). This is an excellent tool for automatically setting up users Exchange Profiles, if needed, when they logon to the NT domain. This tool can also be used to reconfigure users profiles when it is necessary (i.e., moving from one Exchange organization to another). This will save many support calls and dollars. Click here to download. Click here for the ProfilER's help file with screen shots and help information. For additional information regarding our online purchase products please contact us via email at sales department or via phone at 281-587-1990. Call 281-587-1990 for volume discounts!